At MHM Recycling, we offer waste management solutions with recycling being at the heart of what we do. We manufacture and supply a wide range of equipment for recycling for both small and large-scale environments. We are based in Lincolnshire and Shropshire, but we are able to install our equipment all over the UK. 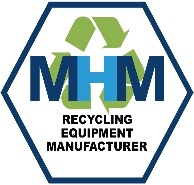 We have our own MHM branded equipment, as well as other market leading recycling machinery, available both new and refurbished. MHM have a dedicated team of service engineers who operate throughout the UK. If making the world a better place through our waste management solutions, then the first step is to arrange a free waste audit. A member of our team will visit your site, and with full training under their belt they will be able to conduct a complete waste management audit. This will allow us to see what you’re already doing when recycling and reducing waste, and areas that could be improved. We aim to provide our clients with efficient and affordable waste management solutions based on our in-depth knowledge of the waste recycling industry and the information we can glean from your audit. Using innovative solutions, we work with you to reduce any landfill waste, helping the environment as well as your own costs, making your business even more valuable. It may be that we stop you sending certain waste streams to landfill saving you a huge cost in landfill tax and transport getting it there and by using certain methods for example baling this waste stream turn your waste into a revenue stream. This means that you will make a saving and a cash generator for your business. When we install your waste management systems, we always make sure everything is up-to-date in terms of any new regulations, so you know that you are legally compliant. We are also able to turn your waste stream into a source of revenue where we can, finding the best market rates for our recycled materials. We stay up to date on all the price trends, as well as regulations, so you don’t have to worry about it and can focus on all the other aspects of running your business. For more information on our waste management solutions, or any other area of our business, please get in teach with our team through our web contact form, or by emailing us at sales@mhmukltd.com. On our contact page, you will also find any phone numbers you need to contact us directly at our main office or our Midlands division, as well as links to social media. A member of our dedicated team will be pleased to answer any questions you may have for us.